AUD 12,191 Excl. Duties / Taxes. This Radiant diamond is 1.51 carat in weight, and comes with Excellent polish and Excellent symmetry, as verified from an independent gemological laboratory. The diamond is graded G in colour, and has a clarity grade of SI1. The diamond's GIA grading report number is 16323193, which will detail further its specifications and measurements, and will also come with the purchase of the stone. This Radiant diamond is 0.9 carat in weight, and comes with Excellent polish and Very Good symmetry, as verified from an independent gemological laboratory. The diamond is graded E in colour, and has a clarity grade of SI1. The diamond's GIA grading report number is 5192618523, which will detail further its specifications and measurements, and will also come with the purchase of the stone. AUD 2,285 Excl. Duties / Taxes. This Radiant diamond is 0.63 carat in weight, and comes with Excellent polish and Very Good symmetry, as verified from an independent gemological laboratory. The diamond is graded D in colour, and has a clarity grade of VS1. The diamond's GIA grading report number is 5202130560, which will detail further its specifications and measurements, and will also come with the purchase of the stone. AUD 2,580 Excl. Duties / Taxes. This Radiant diamond is 0.7 carat in weight, and comes with Very Good polish and Good symmetry, as verified from an independent gemological laboratory. The diamond is graded D in colour, and has a clarity grade of VS1. The diamond's GIA grading report number is 1669725, which will detail further its specifications and measurements, and will also come with the purchase of the stone. AUD 69,953 Excl. Duties / Taxes. This Radiant diamond is 3.01 carat in weight, and comes with Very Good polish and Good symmetry, as verified from an independent gemological laboratory. The diamond is graded G in colour, and has a clarity grade of IF. The diamond's GIA grading report number is 6173804100, which will detail further its specifications and measurements, and will also come with the purchase of the stone. This Radiant diamond is 1 carat in weight, and comes with Excellent polish and Good symmetry, as verified from an independent gemological laboratory. The diamond is graded F in colour, and has a clarity grade of VS2. The diamond's GIA grading report number is 1275503419, which will detail further its specifications and measurements, and will also come with the purchase of the stone. This Radiant diamond is 0.82 carat in weight, and comes with Excellent polish and Excellent symmetry, as verified from an independent gemological laboratory. 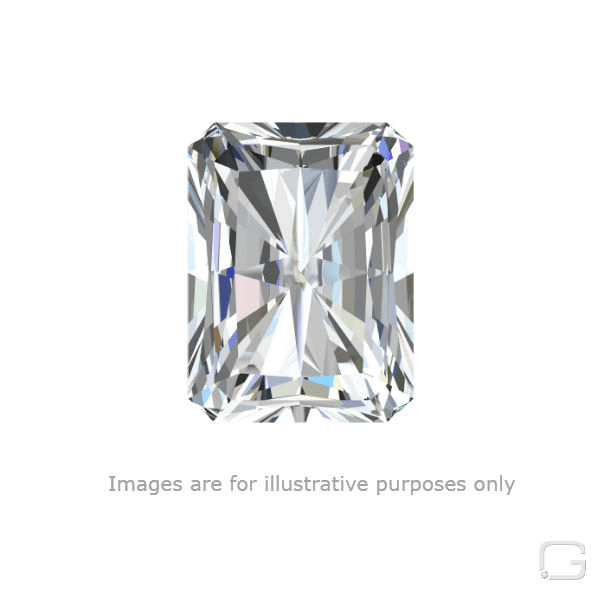 The diamond is graded G in colour, and has a clarity grade of VS1. The diamond's GIA grading report number is 1298540905, which will detail further its specifications and measurements, and will also come with the purchase of the stone. AUD 2,355 Excl. Duties / Taxes. This Radiant diamond is 0.6 carat in weight, and comes with Excellent polish and Very Good symmetry, as verified from an independent gemological laboratory. The diamond is graded D in colour, and has a clarity grade of VS1. The diamond's GIA grading report number is 6194957043, which will detail further its specifications and measurements, and will also come with the purchase of the stone. This Radiant diamond is 1.01 carat in weight, and comes with Very Good polish and Good symmetry, as verified from an independent gemological laboratory. The diamond is graded E in colour, and has a clarity grade of VS1. The diamond's GIA grading report number is 6117345884, which will detail further its specifications and measurements, and will also come with the purchase of the stone. This Radiant diamond is 0.9 carat in weight, and comes with Excellent polish and Very Good symmetry, as verified from an independent gemological laboratory. The diamond is graded E in colour, and has a clarity grade of SI1. The diamond's GIA grading report number is 6295308950, which will detail further its specifications and measurements, and will also come with the purchase of the stone. AUD 2,863 Excl. Duties / Taxes. This Radiant diamond is 0.7 carat in weight, and comes with Excellent polish and Very Good symmetry, as verified from an independent gemological laboratory. The diamond is graded F in colour, and has a clarity grade of VS2. The diamond's GIA grading report number is 6197504335, which will detail further its specifications and measurements, and will also come with the purchase of the stone. This Radiant diamond is 1.01 carat in weight, and comes with Excellent polish and Excellent symmetry, as verified from an independent gemological laboratory. The diamond is graded D in colour, and has a clarity grade of VVS2. The diamond's GIA grading report number is 5191590550, which will detail further its specifications and measurements, and will also come with the purchase of the stone. AUD 5,967 Excl. Duties / Taxes. This Radiant diamond is 1.02 carat in weight, and comes with Excellent polish and Very Good symmetry, as verified from an independent gemological laboratory. The diamond is graded H in colour, and has a clarity grade of VS2. The diamond's GIA grading report number is 6211141501, which will detail further its specifications and measurements, and will also come with the purchase of the stone. This Radiant diamond is 1 carat in weight, and comes with Very Good polish and Good symmetry, as verified from an independent gemological laboratory. The diamond is graded D in colour, and has a clarity grade of SI2. The diamond's GIA grading report number is 1299834654, which will detail further its specifications and measurements, and will also come with the purchase of the stone. AUD 4,970 Excl. Duties / Taxes. This Radiant diamond is 1 carat in weight, and comes with Excellent polish and Very Good symmetry, as verified from an independent gemological laboratory. The diamond is graded D in colour, and has a clarity grade of SI1. The diamond's GIA grading report number is 2185965880, which will detail further its specifications and measurements, and will also come with the purchase of the stone. This Radiant diamond is 1.01 carat in weight, and comes with Excellent polish and Very Good symmetry, as verified from an independent gemological laboratory. The diamond is graded D in colour, and has a clarity grade of VS2. The diamond's GIA grading report number is 6302857539, which will detail further its specifications and measurements, and will also come with the purchase of the stone.